The Jefferson River is an important part of a system of rivers that combine to form the majestic Missouri. 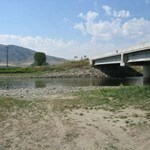 Starting at the confluence of the Big Hole and Beaverhead rivers near Twin ... moreBridges, Montana, it winds 77 miles in a northeasterly fashion to Three Forks. Here, it meets with the Madison and Gallatin rivers that together converge into the Missouri River at the Missouri Headwaters State Park. 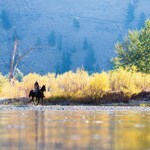 Like so many other rivers in Montana, the Jefferson, named by Clark in honor of the U.S. President, runs deep with history. 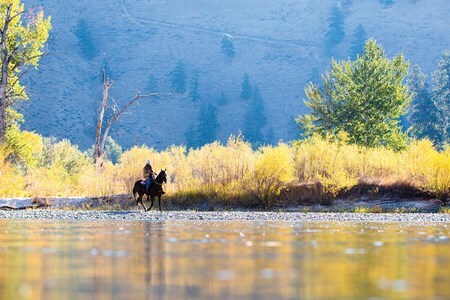 In fact, the Jefferson River is a segment of the larger Lewis and Clark National Historic Trail, administered by our National Park Service. When thinking about the Jefferson, a Class 1 river for recreational enjoyment, most observers view the river in three distinct sections. Characterized by slow, meandering flows, the upper third works its way through a broad, arid valley. 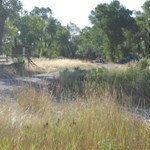 Along this braided, 44 mile long floodplain, you will encounter working farms, dense cottonwood stands, flowered meadows and a variety of wildlife until you reach the town of Cardwell. Throughout the next 15 miles, its waters flow through a narrow, steep canyon where the water can be deep, slow and contained. As a result, the stretch from Cardwell to the Sappington Bridge has comparatively fewer trees, swamps, meadows and wildlife. At Sappington Bridge the river once again becomes a circuitous, rambling river, rich in swamp life, colorful fields, large cottonwood groves and productive agricultural land. The presence of significant agriculture has resulted in competition for water use. 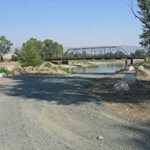 During dry years, the river was tapped generously for irrigation, dropping water levels to the point where fish populations were adversely affected. 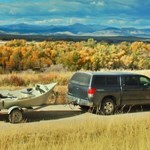 Recent improvement in riparian management has tended to alleviate these issues. 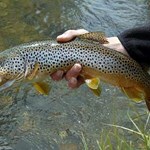 Primarily known as a brown trout river, rainbows, mountain whitefish, burbot and northern pike can also be found here. 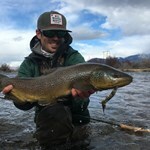 Less well known and less discovered, the Jefferson offers the opportunity to catch large fish in a scenic, un-crowded environment. 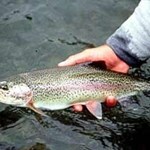 Jefferson River Fishing Report-Things are looking great!